A ‘makers faire’ celebrating our teaching and learning practices, Collaboration and Connections looks at how we use our English and maths to negotiate and build lives, and the role of educator research in making sense of managing it all. How do we reconcile curricula with our learners and contexts? What projects as individuals and teams do we manage to squeeze through and to what effect? How did we do that? How does educational technology help and what alternatives serve better? What numeracies do we find in literacy? What literacies do we find in numeracy? How does language development thread through all of this? What more can a professional learning community add? 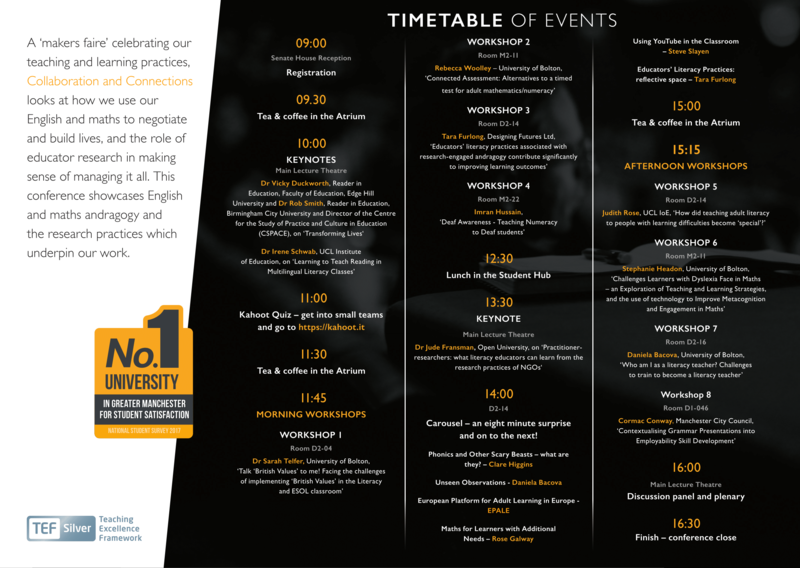 This conference showcases English and maths andragogy and the research practices which underpin our work. Please do disseminate the flyer, available here. An eight minute surprise and on to the next! The conference runs from 09:00 to 17:00. A copy of the programme is available in .pdf format here.